For users 3Ds Max (V-Ray, Corona renderer, Mental ray, Scanline), we have developed an online service, you can now render your projects in automatic mode at any time without technical support. 1.Calculate the cost of rendering in our Megacalculator. 2. Sign in by following the link. Economy, Business, Premium - can be selected in the user’s interface of the online service. Light - available upon agreement with the manager of the farm by using Skype: megarender. For more details about the price can be found here. The Light tariff is ideal for setting one task (miscalculating one scene). Important: when rendering a static image, does not make sense to put the most expensive and the fastest tariff. In that case, you must choose a distributed rendering, check the settings, then the scene will be rendered on 10 CPUssimultaneouslythat will save your time. The cost will be increased by 30%. 4. Refill the balance by any convenient way on tab "FillUpMoney"
5. If you use our service in first time, you can get a 1000 bonus minutes by confirming your cell phone number in the "Bonuses" section on your account. Bonuses are provided to test the render-farm. 6. Pack your scene with the help of our plug-in, acting the instructions. After clicking the button you will go to the "Download scene" tab to add a scene. Here you will find a link to download our mega-plugin. If you previously downloaded a scene, but did not send it for verification, select the already loaded scene and click "Next". If you are interested in additional ways to download a scene, click on the "Details" link at the bottom of the page. 8. Edit the scene settings. All settings of scene are considered to be automatic. If you want to change any settings, you can do it in our interface, which is fully consistent with 3dsMax settings. Important: when rendering a still image, it makes no sense to put the most expensive and fastest tariff. In this case, you need to select distributed rendering by ticking the settings, then the scene will be rendered immediately on 10 processors, which will save time. At the same time, the consumption of minutes is increased by 10 times, and the overhead as compared to rendering on 1 processor will increase the consumption by about 30%. When status is“Running”, if the image has already been formed, click the “Detail” and you can see a preview and the approximate time of the end of the rendering. Holded by billing- system stopped due to the lack of funds. You need to fill up your balance to continue the work. 12. 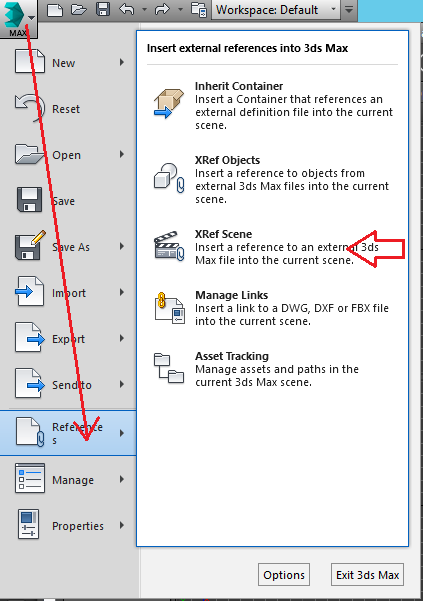 If you use xref, then before you pack the scene, they need to be merged. To do this, open the tab with xref'-scenes. Select the necessary objects and click Merge.